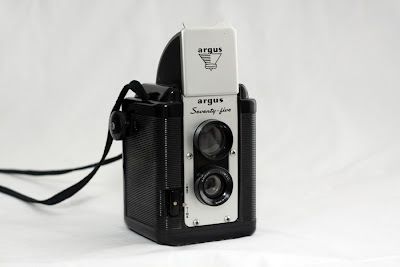 Since I get so many people coming to my blog these days from Pinterest, specifically interested in the post My Vintage Camera Collection, I thought I would post an update on some of the vintage cameras I have acquired since that original post was made. Argus Seventy-Five Camera- A pseudo twin lens bakelite camera. Takes 620 film. c. 1949-55. Coronet 3-D Camera (w/ Binocular Viewfinder)- Bakelite stereo camera, taking 127 film. c. 1954. Light Meters- L: Weston Model 850. 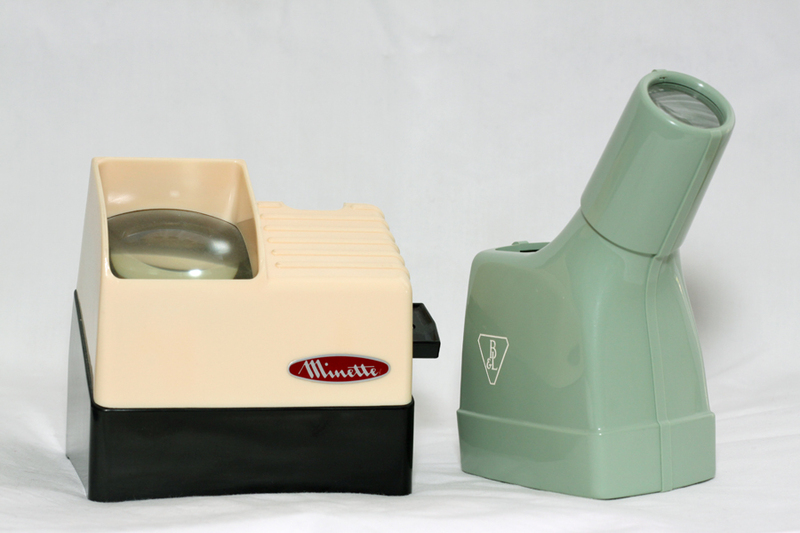 Bakelite. c. 1938. 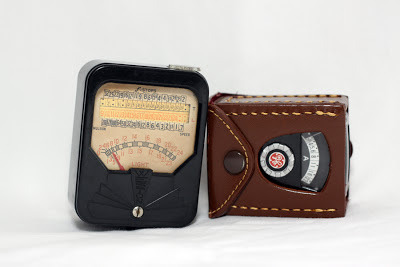 R: Mascot General Electric Exposure Meter, type PR-30 (in case). c. 1954. R: Bausch and Lomb Enlarging Focusing Magnifier. c. 1958. 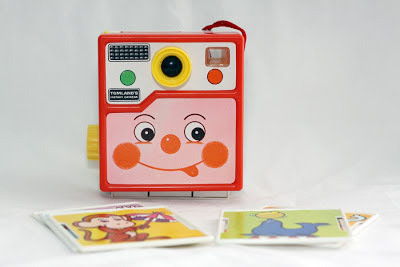 Toy Instant Camera- by Tomland Industries. 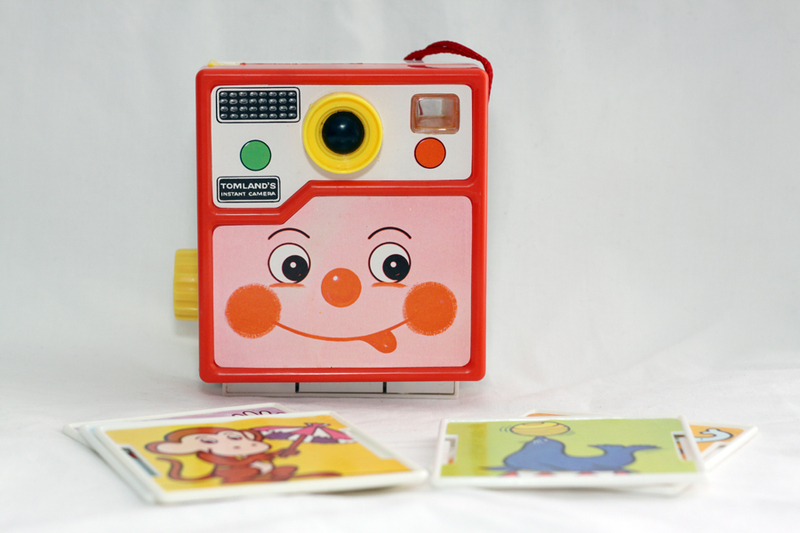 Comes with a play cassette that you load with plastic pictures that come out when you "shoot" a picture. c. 1979. I'm not a serious camera collector. I buy the cameras that I like and can afford at the time. I've sold a hand full of my vintage cameras so that I can get different ones. But, I have learned a few things along the way both from my experience as a buyer, and my experience working for a seller. You can find vintage cameras in a variety of places, but some places are better to buy them than others. 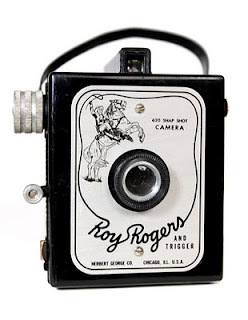 Estate sales, yard sales, and auctions occasionally have cameras for sale, but it's time consuming to seek these out. You can sometimes find good buys at estate sales when the person selling them doesn't know what they have, and auctions when things are sold in lots can also be good deals. Live auctions are hit or miss... sometimes they go for more than what they are worth, and sometimes less. You can almost always find vintage cameras at antique stores, but usually the person selling them doesn't know their worth and prices them higher than what they are actually worth. They also don't test them, so if you want a working camera in good condition, I would suggest staying clear of antique malls or stores. I purchased my very first vintage camera at an antique store, before I knew anything about vintage equipment and their worth, and I paid about three times what it was worth. Many people assume that because a camera is old or vintage, that it must be worth something. This is not the case. Some vintage cameras may only be worth $5, so checking their worth is more important than you may think. Online sites like eBay or even Etsy have plenty of cameras to choose from. This route is usually a good bet, although sometimes also a hit or miss depending on the seller. I would suggest comparing prices when buying online, and also checking what the other items are that the shop or seller has available. If they strictly sell camera equipment, you have a better chance of getting something for closer to what it is worth than someone who has one camera in their shop and a bunch of other stuff. Although these sellers will occasionally sell cameras for cheaper, since again, they may under price something. A red flag is when an online seller says that the item is "rare". It may indeed be rare, but more times than not, it's not. Here's another instance when doing some research will help you from getting taken advantage of. Your best bet is probably to buy from a reputable used equipment dealer. These places may have bargains on the older cameras that aren't worth much, but on actual collectible or rare items, they will be priced for what they are worth. 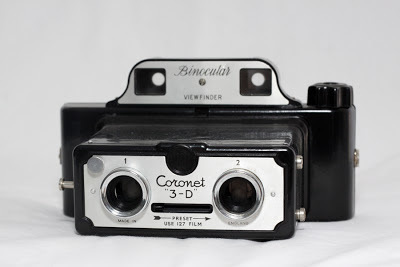 The plus to one of these sellers, if you are serious about collecting, is that usually they clean up the item, they know exactly what they are selling and can offer more information on it, and often even test the equipment beforehand and should tell you in their listing if it's a working camera or not, and what the condition of it is. I have purchased 75% of my vintage cameras from one of these resellers, specifically KEH Camera. If you're just buying to have a few good looking "shelf cameras", then the details really don't matter as much. Just pick out the cameras you like the look of. If you're really interested in actually collecting though, you really should do some research before your purchase to determine the details of the camera- the make and model, the approximate year that it was made, the material it was made out of, the functions/how it works, what kind of film it takes, and the worth vs. price. Finding out what film it takes is especially important if you want to actually shoot with it, because most vintage cameras produced in the 1950's and earlier take film that you may not be able to get any longer. As far as checking the worth, the camera collectors bible is McKeown's Price Guide to Antique and Classic Cameras. These books don't come cheaper though. For the current addition, it will run you about $70-$100, but it will be worth it if collecting is something you really want to get into.